In this Japanese name, the family name is Ozawa. Seiji Ozawa (小澤 征爾, Ozawa Seiji), born September 1, 1935, is a Japanese conductor, known for his advocacy of modern composers and his work with the San Francisco Symphony, the Toronto Symphony, and the Boston Symphony. He is the recipient of numerous international awards. Ozawa was born on September 1, 1935, to Japanese parents in the city of Mukden, Manchukuo (now Shenyang, China). When his family returned to Japan in 1944, he began studying piano with Noboru Toyomasu, heavily studying the works of Johann Sebastian Bach. After graduating from the Seijo Junior High School in 1950, Ozawa sprained his finger in a rugby game. Unable to continue studying the piano, his teacher at the Toho Gakuen School of Music, Hideo Saito, brought Ozawa to a life-changing performance of Beethoven's Symphony No. 5, which ultimately shifted his musical focus from piano performance to conducting. Almost a decade after the sports injury, Ozawa won the first prize at the International Competition of Orchestra Conductors in Besançon, France. His success in France led to an invitation by Charles Münch, then the music director of the Boston Symphony Orchestra, to attend the Berkshire Music Center (now the Tanglewood Music Center) where he studied with Munch and Pierre Monteux. In 1960, shortly after his arrival, Ozawa won the Koussevitzky Prize for outstanding student conductor, Tanglewood's highest honor. Receiving a scholarship to study conducting with famous Austrian conductor Herbert von Karajan, Ozawa moved to West Berlin. Under the tutelage of von Karajan, Ozawa caught the attention of prominent conductor Leonard Bernstein. Bernstein then appointed him as assistant conductor of the New York Philharmonic where he served during the 1961/62 and 1964/65 seasons. While with the New York Philharmonic, he made his first professional concert appearance with the San Francisco Symphony in 1962. 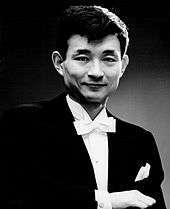 In December 1962 Ozawa was involved in a controversy with the prestigious Japanese NHK Symphony Orchestra when certain players, unhappy with his style and personality, refused to play under him. Ozawa went on to conduct the rival Japan Philharmonic Orchestra instead. From 1964 until 1968, Ozawa served as the first music director of the Ravinia Festival, the summer home of the Chicago Symphony Orchestra. In 1969 he served as the festival's principal conductor. He was music director of the Toronto Symphony Orchestra from 1965 to 1969 and of the San Francisco Symphony from 1970 to 1977. In 1972, he led the San Francisco Symphony in its first commercial recordings in a decade, recording music inspired by William Shakespeare's Romeo and Juliet. In 1973, he took the San Francisco orchestra on a European tour, which included a Paris concert that was broadcast via satellite in stereo to San Francisco station KKHI. He left San Francisco after a dispute with a players committee over granting tenure to two young musicians Ozawa had selected. From 1977 to 1979, he was the resident conductor for the Singapore Philharmonic Orchestra. He returned to San Francisco as a guest conductor, including a 1978 concert featuring music from Tchaikovsky's ballet Swan Lake. Between the years of 1964 and 1973, he directed various orchestras until he became music director of the Boston Symphony Orchestra in 1973. His tenure at the BSO was maintained for 29 years, the longest tenure of any music director, surpassing the 25 years held by Serge Koussevitzky. Ozawa won his first Emmy Award in 1976, for the Boston Symphony Orchestra's PBS television series, Evening at Symphony. In 1994, the BSO dedicated its new Tanglewood concert hall "Seiji Ozawa Hall" in honor of his 20th season with the orchestra. In 1994, he was awarded his second Emmy for Individual Achievement in Cultural Programming for "Dvořák in Prague: A Celebration". In an effort to merge all-Japanese orchestras and performers with international artists, Ozawa, along with Kazuyoshi Akiyama, founded the Saito Kinen Orchestra in 1992. Since its creation, the orchestra has gained a prominent position in the international music community. In the same year, he also made his debut with the Metropolitan Opera in New York. Ozawa caused controversy in 1996/97 with sudden demands for change at the Tanglewood Music Center, which caused Gilbert Kalish and Leon Fleisher to resign in protest. A controversy subsequently developed over various perceptions of the quality of Ozawa's work with the BSO. Ozawa stood down from the BSO music directorship in 2002. Ozawa has been an advocate of 20th-century classical music, giving the premieres of a number of works including György Ligeti's San Francisco Polyphony in 1975 and Olivier Messiaen's opera Saint François d'Assise in 1983. He also became known for his unorthodox conducting wardrobe, where he wore the traditional formal dress with a white turtleneck rather than the usual starched shirt, waistcoat, and white tie. In 2001, Ozawa was recognized by the Japanese government as a Person of Cultural Merit. In 2002, Ozawa became principal conductor of the Vienna State Opera. Ozawa continues to play a key role as a teacher and administrator at the Tanglewood Music Center, the Boston Symphony Orchestra's summer music home that has programs for young professionals and high school students. On New Year's Day 2002, Ozawa conducted the Vienna New Year's Concert for the first (and only) time. In 2005, he conducted the Tokyo Opera Nomori's debut of Richard Strauss’ Elektra. On February 1, 2006, the Vienna State Opera announced that he had to cancel all his 2006 conducting engagements because of illness, including pneumonia and shingles. He returned to conducting in March 2007 at the Tokyo Opera Nomori. Ozawa stepped down from his post at the Vienna State Opera in 2010, to be succeeded by Franz Welser-Möst. In October 2008, Ozawa was honored with Japan's Order of Culture, for which an awards ceremony was held at the Imperial Palace. He is a recipient of the 34th Suntory Music Award (2002) and the International Center in New York's Award of Excellence. On 6 December 2015, Ozawa was honored at the Kennedy Center Honors. Ozawa holds honorary doctorate degrees from Harvard University, the New England Conservatory, the University of Massachusetts Amherst, National University of Music Bucharest, and Wheaton College. 1981: Grammy for "Best solo instrument performance with orchestra"
Ozawa has three brothers, Katsumi, Toshio, and Mikio, the latter of whom became a music writer and radio host in Tokyo. Seiji Ozawa is married to Vera, who was former model and actress Miki Irie, and he was previously married to pianist Kyoko Edo. Ozawa has two children with Irie, a daughter named Seira and a son named Yukiyoshi. To help his children have the experience of being raised in Japan, Ozawa was forced to contact them predominantly by telephone throughout his tenure with the BSO. During this time, Ozawa became a fan of the Boston Red Sox and New England Patriots. Seiji Ozawa and Mstislav Rostropovich formed a travelling musical group during the later stages of Rostropovich's life, with the goal of giving free concerts and mentoring students across Japan. ↑ "Seiji Ozawa". Naxos. Retrieved 17 August 2009. 1 2 Aaron Green. "Seiji Ozawa - A Profile of the Great Conductor". Classicalmusic.about.com. Retrieved 2016-01-06. ↑ "Keeping Time at Tanglewood". Operanews.com. Retrieved 2016-01-06. 1 2 3 "Seiji Ozawa (Conductor) - Short Biography". Bach-cantatas.com. Retrieved 2016-01-06. ↑ Nakasone, Yasuhiro (1999). The Making of the New Japan: Reclaiming the Political Mainstream. trans. Lesley Connors. Routledge. pp. 170–171. ISBN 0-7007-1246-1. ↑ Anthony Tommasini (31 March 2002). "A Last Bow, To Polite Applause". The New York Times. Retrieved 2007-10-12. ↑ Sandow, Greg (December 15, 1998). "Conduct(or) Unbecoming the Boston Symphony". The Wall Street Journal. gregsandow.com. Retrieved 2013-07-18. ↑ Dezell, Maureen (December 16, 1998). "Ozawa's supporters rebut Journal attack". The Boston Globe. gregsandow.com. Retrieved 2013-07-18. ↑ Dezell, Maureen (December 25, 1998). "Beleaguered BSO Answers Wall Street Journal Attack". The Boston Globe. gregsandow.com. ↑ Platt, Russell (June 17, 2013). "The Rite Stuff". The New Yorker. Retrieved 2013-07-18. ↑ Lloyd Schwartz, "So long, Seiji! ", Boston Phoenix, 25 April – 2 May 2002. ↑ "Cultural Highlights; From the Japanese Press (August 1–October 31, 2001)," Japan Foundation Newsletter, Vol. XXIX, No. 2, p. 7. ↑ Matthew Westphal (21 March 2007). "Seiji Ozawa Returns to Podium After More Than a Year". Playbill Arts. Retrieved 2007-10-12. ↑ Matthew Westphal (6 June 2007). "Vienna State Opera Appoints Dominique Meyer Its Next Director, with Franz Welser-Möst as Music Director". Playbill Arts. Retrieved 2007-10-12. ↑ "Ozawa Discloses Cancer and Cancels Concerts for 6 Months". The New York Times. 1994-04-14. Retrieved 2015-12-30. ↑ "Conductor Seiji Ozawa vows to return to work". BBC News. 2012-03-13. Retrieved 2014-12-25. ↑ "Japanese conductor Seiji Ozawa beats cancer, plans opera". South China Morning Post. 2014-08-05. Retrieved 2014-12-25. ↑ Vishnevetsky, Ignatiy (14 November 2016). "Haruki Murakami prods a great conductor for insight in Absolutely On Music". The A.V. Club. Onion Inc. Retrieved 16 November 2016. ↑ "Hall at Tanglewood Named for Ozawa". The New York Times. 1994-04-14. Retrieved 2015-12-30. ↑ "Seiji Ozawa Nagano Winter Olympics". ↑ "UNMB". Unmb.ro. Retrieved 2016-01-06. ↑ "Reply to a parliamentary question" (PDF) (in German). p. 1521. Retrieved 20 November 2012. ↑ "Reply to a parliamentary question" (PDF) (in German). p. 1921. Retrieved 20 November 2012. 1 2 Lakshmanan, Indira (1998-09-20). "Orchestrating Family Life in Japan". The Boston Globe. Retrieved 2015-12-30. 1 2 Lakshmanan, Indira (1998-09-20). "His Other Life in Japan". The Boston Globe. Retrieved 2015-12-30.